You are having dinner in a restaurant you are an important regular at, with your friend setting you up with two very attractive women. Within seconds, a car comes hurtling through the window, decapitating one girl, crushing the other and effectively shearing your leg off.Dragged out of the restaurant with your what is left of your leg, you mown down most of the people after you, whilst ending up almost burnt alive. At deaths door you awaken a slumbering power, two tentacles pop out your back and you selectively disembowel and eviscerate the men who came to kill you. Welcome to the first 5 minutes of The Darkness 2. This mad world you dive into headfirst is neatly explained by the narrator of the game, Johnny Powell, as he takes you through the previous action packed precursor. You are Jackie Estacado, a new mob boss in town after gaining access to the gift called ‘The Darkness’; a dark, warped manifestation of all that is bad as it feeds on the hearts of the hosts (that’s you) many enemies and, eventually the host itself. The game is set a few years after the first, where Jackie attempts to deal with the fact that the only love in his life was murdered by his uncle; the Darkness paralysed Jackie and made him watch. Jackie, aware of the huge amount of power he has at his finger tips which , in all likelihood, would make him lose his humanity, keeps it inside of him until the events stated above leave him no other option. 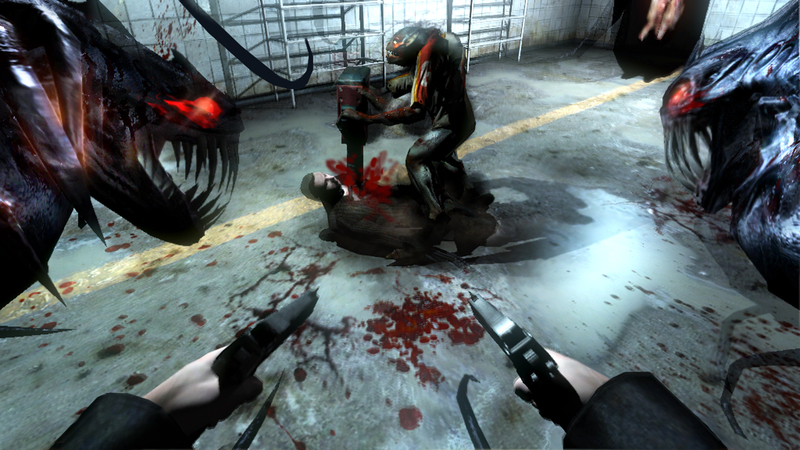 The first Darkness isn’t imperative to play to get any real grasp on the story but I would still highly recommend it in itself as it is perhaps one of the most underrated FPS to come out on this generation of consoles. The story itself is derived largely from the comics, with key characters popping up along the course of the game. This makes it even more compelling due to the very strong foundations the whole story is based on and also highlights The Darkness 2’s biggest problem. You will almost certainly play through Jackie Estacado’s trials and tribulations in 6 hours or less on a medium difficulty, with a multiplayer coop mode that essentially feels tacked on and seems poor compared to the main product. The short ride you will have with the game however, is more than worth it as the whole experience gives a real sense of empowerment but without making you feel like Superman (remember Superman 64?!). Light and dark are key elements of the game with all of your powers ,other than the standard ‘firing a gun’. made redundant as soon as you step into a large light source, a factor that isn’t lost on the enemy. Taking rooms one by one by choosing whether to take power sources and lights out and let the Darkness powers let rip or pick enemies off one by one is refreshing rather than tedious. I would never class it as a cerebral shooter but its nice to have the option to choose how I maim and kill. Speaking of which, maiming and killing is the name of the game here. Jackie is able to combine two weapons alongside two tentacles that appear over his shoulders, emanating from the Darkness itself ,to aide his fight against the many gangsters and cultists you meet along the way. All can be used in conjunction with each other so tackling situations is completely up to you; you are more than welcome to go all guns blazing but you have the option to use car doors as shields, use iron poles as javelins and slice your attackers, literally in half. Gunplay is effective and most importantly enjoyable, with every weapon feeling powerful and actually useful. Despite all that is going on onscreen I never felt like I wasn’t in control when I was shooting which, considering the mayhem you create in each level, is incredibly impressive. An RPG element is also utilised depending on the type of kills you decide to dish out with a skill tree for darkness powers, guns and life; not groundbreaking by any means but it does lead you to enact gorier and more bloody deaths to your enemy. One thing this game never lacks is its blood and gore, in all its cell shaded glory with various kills given more xp depending on the technique and what you used. The game itself is an 18 for a reason; the cell shading used gives the developer the ability to use it as liberally as strawberry jam. There also seems to be a fascination with bones crunching; one unfortunate soul gets his ribcage ripped out in front of him, his heart pulled out and the ‘lucky’ guy gets to watch it beat while he dies. The art direction is a big departure from the first game, swapping realism for a comic esque style. The palette change and abundance of primary colours fits in nicely with its comic book roots and makes the cut scenes, each mission is framed by Jackie speaking about his life, much more animated than they were previously. Multiplayer is supposed to run along concurrently with the main story with four characters, each hugely stereotypical (a drunk Irishman, a Japanese samurai etc), attempting to help Jackie. The cut scenes and banter between these characters and Johnny Powell, the narrator, is mildly amusing but the whole scenario is bland. The coop side feels tacked on and a bad attempt at lengthening a very short single player campaign. Wait in area, kill waves, rinse repeat. There is an ability to do all of this on your own but, unless you enjoy achievements, you will get bored extremely quickly. This leaves a review in a difficult position.. The combination of entertaining game play and an engaging story more than makes up for the turgid multiplayer but the length of the game really lets it done. The best advice would be to pick both this and the prequel up and play them one after each the other; a simple solution to the short gameplay time problem that you are unlikely to regret! Opinion Piece: Is Bullet Time Overused In Games Today?